Rig Veda: She is like the mother of the cosmic Forces, the daughter of the cosmic Matter, the sister of cosmic Energy, the centre of the ambrosia. I address to men of wisdom –kill not her, the sinless inviolate cow. May the cows be our affluence; may the resplendent Lord grant us cattle; may the cows yield food (milk and butter) of the first libation. These cows, O men, are sacred as the Lord resplendent Himself –the Lord whose blessings we crave for, with head and heart. 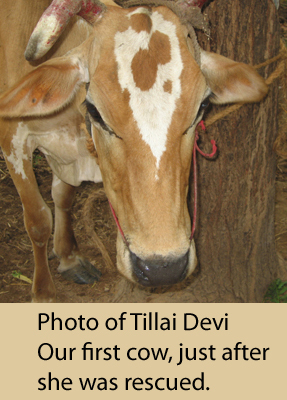 “Cow protection is the gift of Hinduism to the world. And Hinduism will live so long as there are Hindus to protect the cow. Hindus will be judged not by their tilaks, not by the correct chanting of mantras, not by their pilgrimages, not by their most punctilious observances of caste rules, but their ability to protect the cow. “I would not kill a human being to protect a cow, as I will not kill a cow to save a human life, be it ever so precious. My religion teaches me that I should by personal conduct instill into the minds of those who might hold different views the conviction that cow-killing is a sin and that, therefore, it ought to be abandoned. My ambition is no less than to see the principle of cow protection established throughout the world. But that requires that I should set my own house thoroughly in order first. “Cow protection to me is not mere protection of the cow. 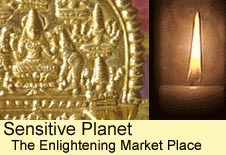 It means protection of all that lives and is helpless and weak in the world. “The cow is a poem of pity. One reads pity in the gentle animal. She is the mother to millions of Indian mankind. Protection of the cow means protection of the whole dumb creation of God. The ancient seer, whoever he was, began with the cow. The appeal of the lower order of creation is all the more forcible because it is speechless. The cow is the purest type of sub-human life. She pleads on behalf of the whole of the sub-human species for justice to it at the hands of man, the first among all that lives. She seems to speak to us through her eyes: ‘You are not appointed over us to kill us and eat our flesh or otherwise ill-treat us, but to be our friend and guardian.’ I worship it and I shall defend its worship against the whole world. “Mother cow is in many ways better than the mother who gave us birth. Our mother gives us milk for a couple of years and then expects us to serve her when we grow up. Mother cow expects from us nothing but grass and grain. Our mother often falls ill and expects service from us. Mother cow rarely falls ill.